Edgar Allan Poe was the first American writer to attempt to support himself solely on writing alone. He wrote the first modern detective story, the first modern science fiction story, and founded the modern horror genre. His famous, tragic love for his wife, Virginia, helped to inspire his landmark poem, The Raven. Speculation over the cause of his mysterious death in 1849 continues to this day. His writings still speak to us more than 160 years later and have inspired countless stage and film adaptations. This great writer is brought to life for your school, library, or literary organization by Campbell Harmon in dramatic readings, historical biography, and direct audience interaction. Please email edgar@thepoeactor.com for booking and honorarium information. 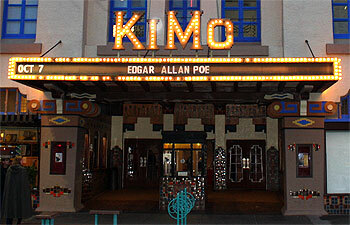 Bear in mind that October is the most popular month for Poe performances. Check the calendar on the right to see upcoming performances as well as closed dates for October. Performances in other months are more flexible for scheduling. Reserve your performance date as early as possible. Speaker Biography (pdf) with links to photos. A one hour program with dramatic performances of The Tell-Tale Heart and The Raven. 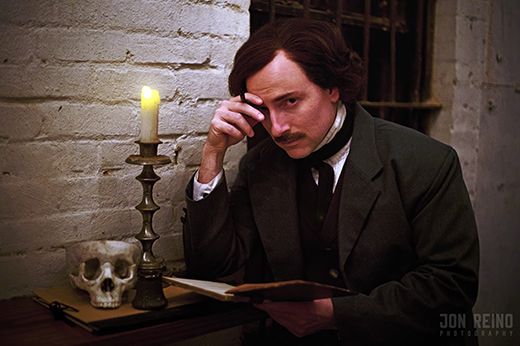 Campbell speaks in-character as Poe with the audience about the author's life, his death, and his profound influence on American literature; dispelling the myths that have surrounded his legacy to show how his works continue to affect us today. A two hour show is also available with additional readings of poems and The Cask of Amontillado. The program is suitable for all ages and venues. "Excellent Poe! He was fantastic." "Informative-I enjoyed the history of Poe and offshoots of his works." "Harmon was a wonderful choice and really brought life to Poe. Thank you!" "Excellent performer. Gifted Poe Actor. Very Knowledgeable." "Outstanding! Mr. Poe was an absolute delight! A true master in his executions! Thank you." "Once in a lifetime-will never forget!" "Re: The Big Read events. My family and I were able to attend a library event, the Dead Poets Slam, and Boo at the Bushnell. All were excellent. Our daughter is a big horror fan and has loved Mr. Poe since fifth grade. These events gave her an opportunity to learn more about a genre she loves and some insight into what goes into the creation of these art forms. [Campbell's] Poe improved with each performance. I was deeply touched by Poe's difficult life and his heroic struggles to create art and support his chosen family. I was also grateful to [Campbell] for the tact and sensitivity he displayed in handling what could have been some tricky questions regarding Mr. Poe's personal life, given the ages of some of the audience members. 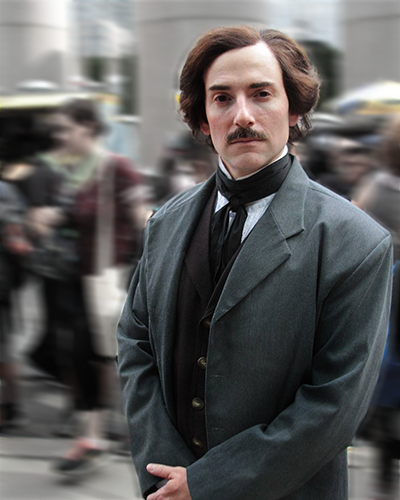 Campbell Harmon as Edgar Allan Poe at NYCC. This calendar is tentative and dates may change without notice. Please email directly to check for any booking availability. 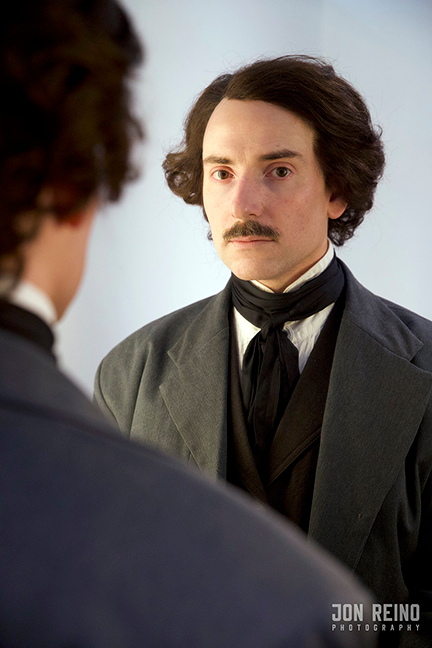 Campbell Harmon as Edgar Allan Poe. Photo by Jon Reino Photography. 2012 February 14, East Shore Middle School, Milford, CT.
2012 February 10, Babcock Library, Ashford CT.
2011 October 7-11, Albuquerque/Bernalillo County Big Read!, Albuquerque, NM. 2011 October 13, 6:30pm, Torrington Public Library, Torrington, CT.
2010 October 20, 7pm, Cromwell Public Library, Cromwell CT.
2010 October 27, 6:30pm, Rocky Hill Public Library, Rocky Hill, CT.